Former Vice President Al Gore talks to the media after meeting with President-elect Donald Trump at Trump Tower on Monday in New York City. 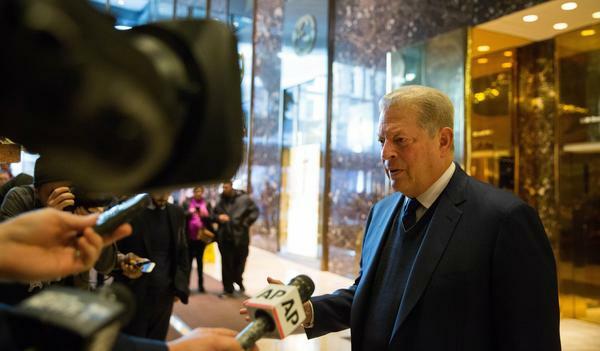 In what may be the most unlikely meeting of the presidential transition process so far, former vice president, former Democratic presidential nominee, former senator and Nobel Peace Prize winner Al Gore met with President-elect Donald Trump on Monday. Gore has spent decades warning about the dire consequences of unchecked, man-made climate change, while Trump has regularly called climate change "a hoax" during the campaign. Initially, the session was not even expected to include the president-elect. According to the transition spokesman, it was scheduled as a sit-down between Gore and Trump's daughter, Ivanka, who is a member of the official transition team. Ivanka Trump, 35, is also an executive with the Trump Organization, and Trump has described her as one of his most trusted advisers. There was no preview of the agenda for the former vice president and the president-elect's daughter. Politico reported last week that Ivanka, who is expected to play some of the social roles typically occupied by the first lady, is interested in making climate change one of her signature issues. Since the election, she has met with actor and climate change activist Leonardo DiCaprio to discuss the issue, when he, according to the New York Times, gave her a copy of his documentary film on the topic. A full 90 minutes after Gore entered Trump Tower, the golden elevator doors in Trump Tower's lobby opened and Gore emerged, according to pool reports. In a very brief statement to reporters staking out the lobby, Gore revealed that he spent most of his time upstairs meeting with Trump himself. "I had a lengthy and very productive session with the president-elect. It was a sincere search for areas of common ground," said Gore. "I had a meeting beforehand with Ivanka Trump. The bulk of the time was with the president-elect, Donald Trump. I found it an extremely interesting conversation, and to be continued, and I'm just going to leave it at that." It's not clear exactly how Ivanka Trump's views on climate change differ from her father's and what influence she might have on him. He has proposed walking away from the 2015 Paris Agreement to reduce global greenhouse gas emissions. As a candidate, Trump championed the American coal industry, saying that environmental regulations had harmed the industry and cost the jobs of miners.